The 40th Annual Iowa State University Meat Evaluation Contest was hosted in the Iowa State University Meat Laboratory on Saturday, February 10. Ten teams (76 contestants) competed in this annual event: Iowa State University, Kansas State University, North Dakota State University, Oklahoma State University, South Dakota State University, Tarleton State University, The Ohio State University, University of Missouri, University of Nebraska, and West Texas A&M University. The team won beef judging, was third in beef grading and reasons, and fifth in lamb judging. Kaitlyn Olson (Luana) was high individual in beef judging and 10th in reasons; Kaitlyn Boyer (Weldon) was 6th in beef grading and earned high individual honors on the ISU team; Darin Koch (Osage) was 6th in beef judging; Hannah Engle (Ames) was 8th in beef judging; Georgia Androy (Malvern) was 10th in reasons; and Macy Leonard (Newton) was 10th in beef grading. Team members also include Shelby Deaton (Baxter) and Jennifer Vander Lee (Hartley). The top six teams were: Kansas State University, Oklahoma State University, South Dakota State University, University of Wyoming, University of Missouri, and Iowa State University. 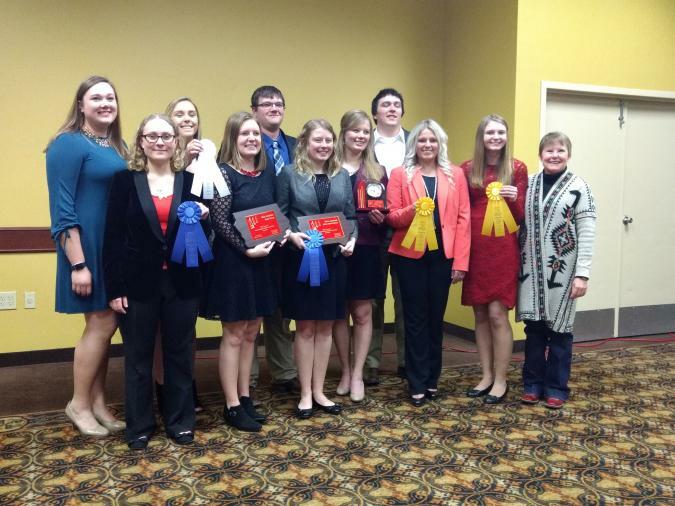 In conjunction with the contest, the 1988, 1998, and 2008 Iowa State University Meat Judging Teams were recognized at the Saturday evening awards banquet, and gift baskets prepared by ISU meat judging teams were offered in a silent auction and presented to the high bidders at the banquet. Additionally, an alumni meat judging contest was hosted on Sunday. Nearly 40 alumni came back to the meat lab and reminisced about their judging days and a beautiful belt buckle was presented to Dr. Olsen in recognition of her 10th year of coaching and coordinating the program. Organized by 2015 team members Alex Conover (Ames) and Carl Frame (Osseo, WI), these activities were enjoyed by everyone and up to $1700 was raised to support the program.